This is a blog of passion. 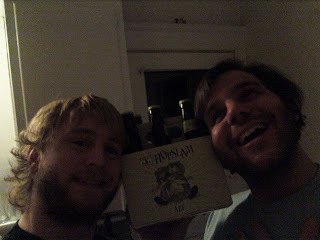 Having tried this brew a year ago, we decided to pick up an eighteen dollar six pack of it this Sunday. It didn't last a mere two hours once we got it home. So this Wednesday, Mike drove thirty miles in a snow storm to get more. Was it worth risking his life for? You're goddamn right it was! We have had a great many Bell's and a great many IPA's but today, we have never been more proud to present our official review of Bell's Hopslam Ale. The pour is an orangish golden color and the smell is pure imagination. The taste, heaven. We can not express our love for this beer in full detail in just one blog. Let's just put it this way: If we were Harry, this is when we met Sally or as Oz would say, "When Noah met Allie." Honey overtones soften the hops but in a tasteful way to not discourage hopheads like ourselves. Bell's Hopslam has just the right amount of kick and alcohol flavor while the hops linger the way an IPA should. This 10% IPA has one major downfall, it's limited release. Seriously, even the hefty price tag isn't the issue. We could drink Hopslam all year round. This March, when the beer markets and liquor stores stop selling this fine IPA, we will be like Rose from the Titanic, we'll "never let you go." Hopslam, you will alway have our hearts as well as our stomach's. We will enjoy you as much as we can this year and only hope Bell's brings you back next. A new high for the blog.